The random collection of topics below share only the common feature that I find them intriguing. Much of the material is "well known", or at least in the literature somewhere. But bits are original (most probably the bits that are wrong). As of 21/4/2012 the first item in the list below is my 'work in progress' under the working title "Theoretical Physics: Some Choice Cuts". This link takes you to a page where you can read or download various draft essays in theoretical physics (48 available at present, with a total of 58 planned). The second item in the list below, the 'Introduction to Quantum Mechanics', is a separate tutorial in its own right, and the link starts with an introductory page. If you spot any errors, or have any related questions or clarifications, please do let me know. Schrodinger's Cat Released At Last. When I hear of Schrodinger's cat, I reach for my gun. Why is it that "Which Path" Information destroys interference effects - and what do partial measurements do? The Optical Theorem in the context of particle scattering, and why it's not mysterious after all. The coloured fringes seen when a birefringent material is viewed between crossed polars are systematised by the Michel-Levy Colour Chart. The theory behind this chart is explained here. How Far Can You Go? How far is it possible for a single human, limited by a human lifespan (say, 70 years), to travel in the universe? No, it's not 70 light-years. It's far, far further. The meaning of Spin, Noether's Theorem and the Derivation of the Conservation Laws: What quantity is conserved due to invariance under Lorentz boosts? So you think that Magnetic Monopoles do not exist? Actually, whether or not there are monopoles is just a convention. Radiation due to a Uniformly Accelerating Charge? Does it radiate or not? This fundamental question is a quagmire. Where is the Charge in the Kerr-Neumann Solution? Not where you think it is - and perhaps not there at all. Kepler's Laws derived without solving the equation of motion, and clarification of their physical meaning. If the solutions are conic sections, what is the cone? Why is the Length of the Average Day greater than 12 hours? Ground Source Heat Pumps: where do they get their energy from - is it solar or geothermal? What are the Facts About Climate Change? This is my attempt to present what appears to be the consensus, level headed, scientific position. New comprehensive maps of Greenland and Antarctica show extent of glacier thinning [Credit: ICESat,NASA]. 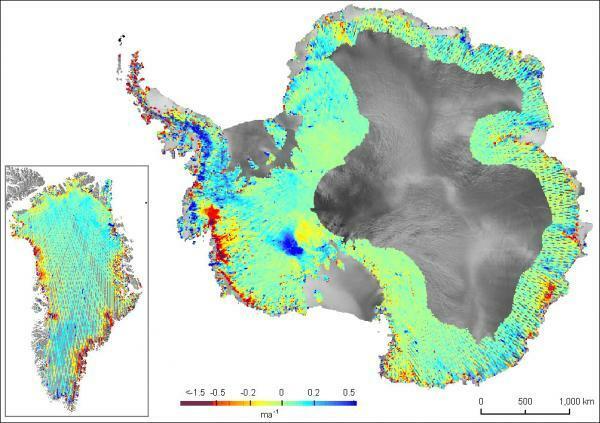 Reporting in September 2009 in Nature, researchers from British Antarctic Survey and the University of Bristol describe how analysis of millions of NASA satellite measurements from both of these vast ice sheets shows that the most profound ice loss is a result of glaciers speeding up where they flow into the sea. The authors conclude that this 'dynamic thinning' of glaciers now reaches all latitudes in Greenland, has intensified on key Antarctic coastlines, is penetrating far into the ice sheets' interior and is spreading as ice shelves thin by ocean-driven melt. Ice shelf collapse has triggered particularly strong thinning that has endured for decades.